On our off day, we had a great opportunity to visit the Sterkfontein Caves at the Cradle of Humankind. The caves were the site of numerous hominid fossil finds, and also have excellent examples of flowstone. Our group is now heading to Musina, a small town near the mine site that we’ll be conducting fieldwork and sampling. Animals and early hominids fell through holes like this one, down into caves where their remains were preserved for future generations to find and study. Ian and Amanda are heading to South Africa for fieldwork. They’ll be visiting the Venetia mine to collect samples of kimberlite, tailings and water. These samples will be asssessed for their potential to sequester carbons dioxide and will be used in laboratory experiments. Looking forward to a successful field campaign! New publication by Li, Hitch, Power and Pan on how to integrate various mineral carbonation strategies into mining operations. Published in Minerals. This instrument will be used to study CO2 mineralization in mine wastes and natural systems. The inorganic carbon is measured by reaction with acid and essentially being titrated. Now it's time to get out into the field this summer and do some sampling! Had a fantastic opportunity to give a seminar in the Department of Earth Sciences at Western University where I did my B.Sc. and Ph.D. Thanks to Robbie Flemming and Phil McCausland for the invitation and hospitality. The topic of my seminar was "Magnesium carbonates: Deposition, diagnosis, rates and implications for carbon storage. Present and past Western Earth Sciences mugs. Seeking applications for three postdoctoral positions in environmental geochemistry/biogeochemistry at Trent University, The University of British Columbia, the University of Alberta. See full advertisement here. Carbon sequestration is an evolving area in geoscience with the potential for scientific breakthroughs, and one that will become increasingly important as the concentration of atmospheric CO2 rises. This Special Issue of Geoscience aims to advance the science of Carbon Sequestration towards enabling society to make informed decisions on the technical, environmental, economic, and social merits of carbon sequestration strategies. We invite contributions that discuss fundamental processes and emerging strategies, field, laboratory, and modelling studies. Guest editors: Ian Power (Trent University) and Anna Harrison (University College London). Published in Crystal Growth & Design, we demonstrate the formation of magnesite at room temperature using carboxylated polystyrene spheres. Scaling this process has implications for sequestering carbon dioxide at Earth surface conditions. 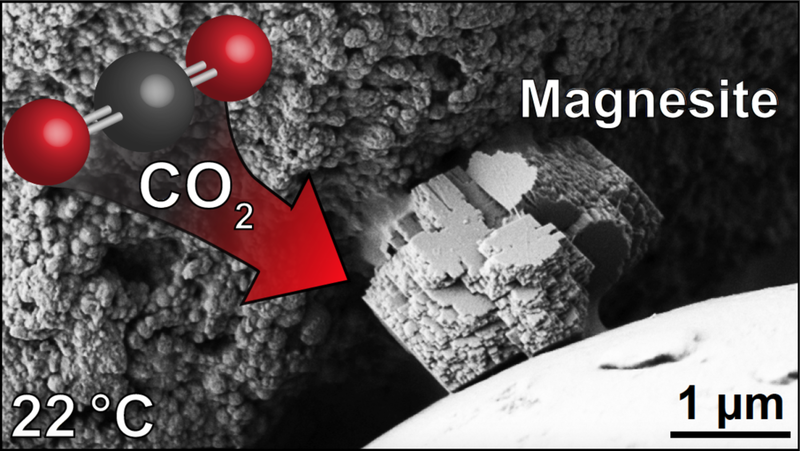 Magnesite crystal on carboxylated polystyrene sphere sequestering carbon dioxide. Great new manuscript published by Lin, Zheng, Ye and Power in Carbonates & Evaporites. This study documents the hydromagnesite deposits from Dujiali Lake, central Qinghai-Tibetan Plateau and its trace and rare earth element geochemistry. Dujiali Lake, central Qinghai–Tibetan Plateau, China. Image of microfluidics experiment showing mineral-rich and -poor zones that impact geochemical reactions. Harrison et al. publishes "Changes in mineral reactivity driven by pore fluid mobility in partially wetted porous media" in Chemical Geology (2017). This innovative study led by Anna Harrison explores mineral reactivity at the pore-scale using microfluidics experiments.